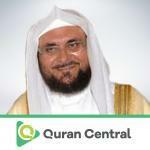 Abdul Wadud Makboul Haneef, commonly known as Abdul Wadud Haneef, is a Saudi Arabian Qari and Imam. In 1414 Hijrah, he led the prayers in the Prophet’s Mosque of Madina and later moved to Al Amira Shahida’s Mosque. The Sheikh’s recitations have been recorded on cassettes which have been aired on television and radio stations.